I am presently reading Michael Palin’s book on Himalaya; where he takes an exotic, enchanting trip along the mighty Himalaya as it spreads into many countries like, Pakistan, India, Nepal & Tibet. A travel series has been aired in BBC. But in his book, he is more personal and less diplomatic is what I feel. He is witty when he narrates certain practices of the east, which may appear not common among westerners. Along his journey he takes us into the lives of people settled in the valleys, close to the Himalayas. 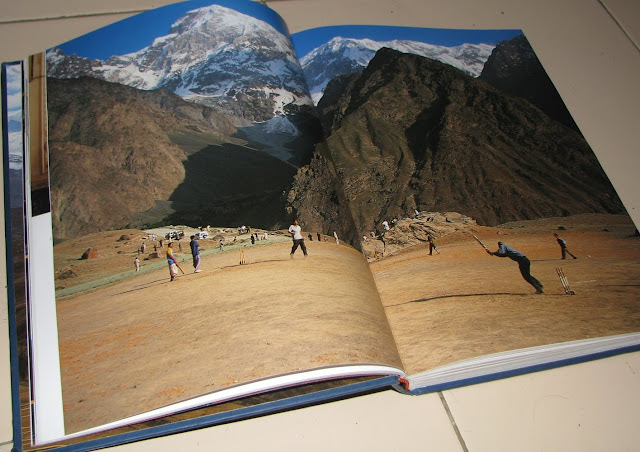 A non-Muslim, non-Urdu speaking community at Rumbur, Pakistan, called Kalash, believed to be descendants of Alexander’s army; People playing cricket at 10,000 Ft high, in a ground surrounded by mountains at Chitral, Pakistan; or a golf match at same height; Glimpses of Shimla, Kashmir and Dharamshala; Close encounters with Maoists at Lekhani, Nepal where British army is recruiting Gurkhas; His almost tiring journey to Annapurna Base camp; all these and much more, that I haven’t read yet, makes this book a little different from the usual travelogue. He explores people and culture along with nature. Basil’s (The Photographer) pictures are next to real. I find British travelers or writers more relatable to me as an Indian, than the Americans. That is an observation so far and certainly not a definite statement. :-) What do you think? “Everything seems different this morning. Perhaps they hate us, stirred to anger by the Maoists, who’ve portrayed us as friends of a corrupt and oppressive government? “…My scepticism thaws a little with the sun and as we walk beyond the camp and look out over the monumental sweep of the glacier that unwinds from the Annapurna Ridge, gouging a valley from the sheer rock, I realize how extraordinarily lucky I am to have seen all this. Well written..need to read this sometime. Thanks for sharing about the book, looks to me very interesting :) and an important resource for my unplanned "Himalaya Trip". BTW, finally I got a chance to watch the movie “Flashbacks of a Fool”, good one! colleagues are like this too. haha..
>If I’m happy, they must be happy. Now I’m suspicious, they must be too. i did not know himalaya lies on pakistan too. Glad you liked the movie FOF...I loved the last song - "If there is something" by Roxy music. Has stayed with me. evocative as well..will pick it up...why dont u do a review on clay ? Thanks for sharing your thoughts on the book. I am always looking for recommendations on travel books. Will pick it up. As for American vs British authors....I don't think I have a preference. I love Bill Bryson and Peter Mayle (British) and a lot of American authors. My problem is more with Indian authors. They write long and complicated sentences. If you spent time in the US, then that is a big no-no. I read this book recently. It is fantastic, his travels and writing style is very impressive. Their documentary is good too!